Track power voltage, load and CS temp. in status bar. Watchdog to keep the connection alive after 30 seconds of idle time. ¹) Commands for the same address are rejected in case the timer did not yet elapsed. Factory default is 192.168.0.111 which is also used if left empty. Default is 21105 if left to zero. 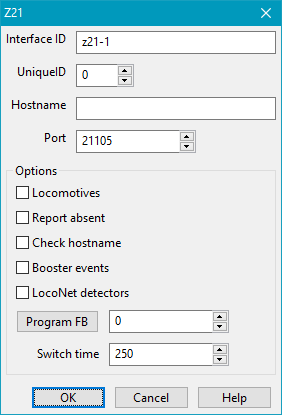 This option is needed for getting (speed, direction and function) info events from the Command Station of manually1) controlled locos to synchronize Rocrail clients. Without this option the subscription on loco info is done individually for each loco after a speed or function command is send from Rocrail. This option must be set if RailCom detectors are connected to the Xpressnet bus of the z21. Program a Roco 10787 sensor module. Make sure only one sensor module is connected to the RMBus. Fill in the wanted address and push the "Program FB" button. Program address zero after the sensor module has acknowledged. Switches, outputs and signals do only use the address field. In the default setting of the z21 / Z21 there is an address offset of +4 between Multimaus and Rocrail. This means that in Rocrail the addresses 1-4 can not be used. If e.g. address 1 of the multimouse is to be used in Rocrail address 5. But there is an elegant way to eliminate this shift. To do this, connect the z21 to the computer via the z21-maintenance-tool, activate the option "DCC-switch address shift +4" resp. "DCC tournout-addressing according to RCN-213" on the "Settings" tab and then confirm with "Write". Then the addresses from 1 can also be used in Rocrail. Addressing is done exclusively according to FADA (flat addressing). Activate only in case of GBM16XN detectors! This option will activate evaluating LAN_LOCONET_DETECTOR messages to support the GBM16XN detectors. The reported input address is increased with one to meet the GBM16XN settings. This conflicts with normal LocoNet! The address is fixed to 21, Interface ID is optional. The Z21 cannot access the LAN when connected to an 'old' Ethernet HUB. 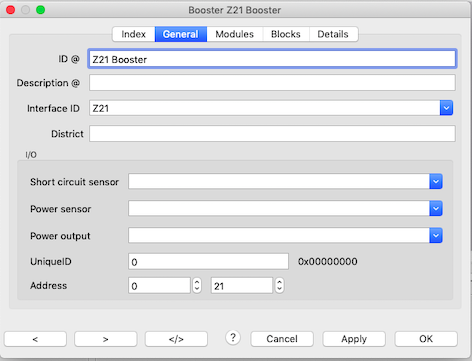 The z21start has a restricted network interface which does not accept commands from Rocrail or other software. To use the z21start with Rocrail an Unlock-Code (10818) or an complete z21 WLAN Package (10814) must be installed.